Spring Propagation Fair March 28-29 in Eugene aimed at preserving Willamette Valley’s diversity of veggies and trees. Plants grow from seeds; we all know that. But saving viable seeds for growing vegetables can be a bit esoteric, and propagating fruit trees is a whole different ball of wax. Gardeners can not only learn about seeds and grafting at the volunteer-run Spring Propagation Fair March 28-29 at the Head Start/Whiteaker School in Eugene, but help themselves to the event’s free seed and scion swap. 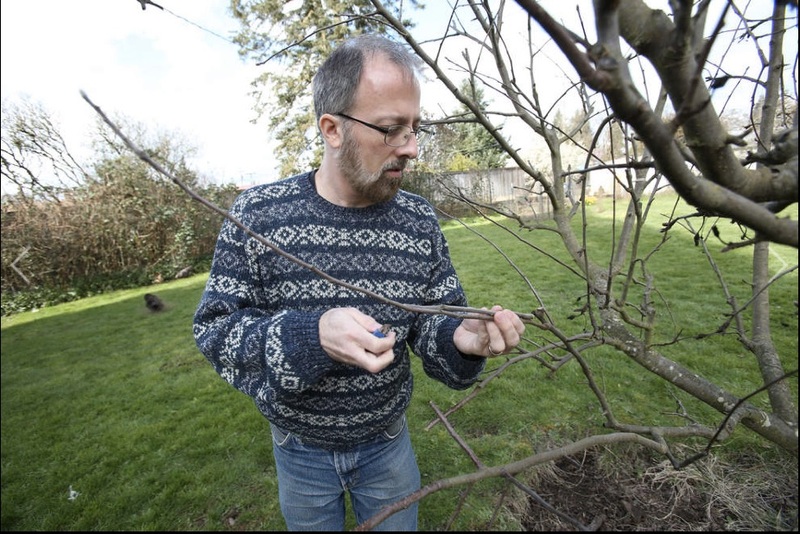 Prier, who teaches homesteading and self-sufficiency skills through his home-based Suburban Homecraft programs in Eugene, discovered the propagation fair about 10 years ago, when it was still just a seed swap. He’s been growing a variety of kale and a Tuscan red onion and saving the seeds to share. On Saturday, March 28, hundreds of varieties of scions (pronounced sy-on), or fruit-tree cuttings, along with vegetable seeds, will be shared at the fair. 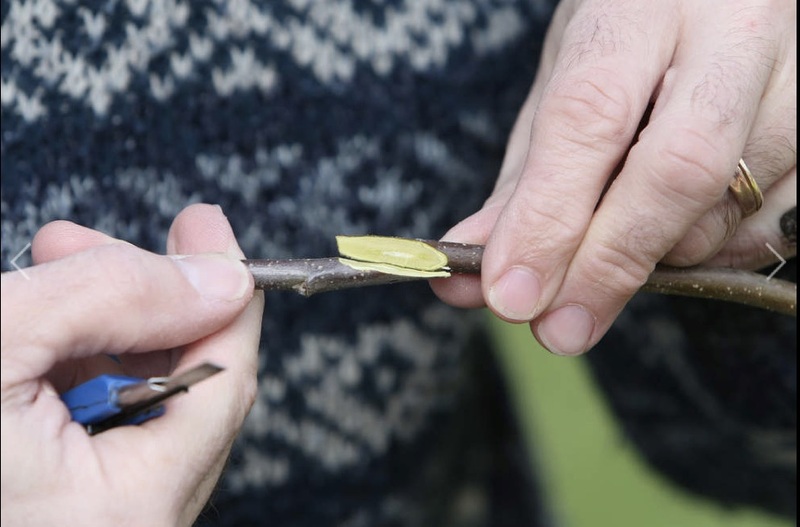 Sunday, March 29 events will include a workshops on grafting, seed saving and more. Prier and other volunteers stepped up to continue the fair after Nick Routledge, a founder of the event, moved away from the area. Originally staged at the Lane Community College campus, it has moved to Head Start/Whiteaker School, 21 N. Grand St. in Eugene, for this year’s event. About six years ago, the fair began receiving collections of scions and rootstock for orchard trees and vines. Grafting scion, or cuttings of last year’s growth, onto rootstock is necessary to reproduce an original cultivar of apples or other fruits. Grafters take rootstock from trees or vines that have the qualities they want, such as disease resistance or mature tree height. Then they find scion wood from a tree that has desirable fruit qualities, such as flavor or ripening time. The two pieces of wood are cut and spliced together, then tightly wrapped so they heal together and grow as one unit. 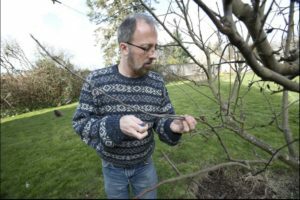 Keegan Caughlin, farm manager at Two Rivers Farm near the McKenzie River in Springfield, has been gathering scions and rootstock for the fair. “This year we are offering just under 300 apples, and that number probably will go up,” he says. In addition, Caughlin plans to have 90 varieties of grapes, 80 varieties of pears and 60 varieties of plums and cherries, he says. Attendees can bring their own rootstock and choose their scion, or purchase the rootstock that is available at the fair. “We do have to buy the rootstock, so we do have to charge the cost for that, which is $3,” says Prier. “We will have professional grafters there if you don’t feel comfortable doing your own grafting. We encourage a donation for that, but it is not required.” There is no charge for the seed/scion swaps or the workshops. Organizers simply ask that attendees not take more seed or scions than they will actually use.